The Decorah boys’ soccer team (4-3) got the job done last week with a pair of wins over Postville and West Delaware. 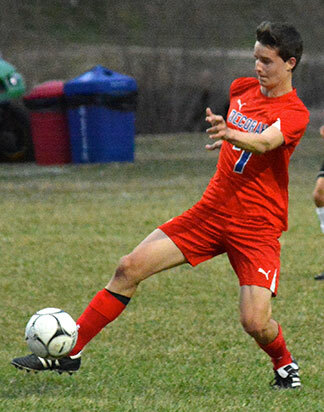 It took some time for Decorah to find its pace against West Delaware Friday night on the road, but once the Vikings began to get into a rhythm the goals piled up for the 7-1 victory. Brayden Krivachek opened the scoring with a goal in the eighth minute, assisted by Beau Hawley and later junior Gabe Austin put the ball in the back of the net in the 17th minute, assisted by Bryce Bockman. The West Delaware offense then took its turn with a goal off a penalty kick to leave the score 2-1 in favor of the Vikings at halftime. The Vikes found the back of the net five times in the second half, scoring at the 57:00 mark and about every five minutes from there on out. Senior Sawyer Vanden Brink opened up second half scoring for the Vikes off a cheeky backheel; Krivachek had the assist. Austin scored his second of the night off a Vanden Brink assist. Vanden Brink wasn’t done just yet; after following up on one of his own shots, the ball ricocheted back to him and he placed the ball in the back of the net. “Sawyer is one of our workhorses out there; he just doesn’t quit. That resulted in two goals and an assist for him, and some motivation for the rest of the team,” said Shockey Trytten. With some beautiful placement, sophomore Tate Schissel finished the last two goals for Decorah, assisted by juniors Willem Hawley and Galen Iverson. The Vikings delivered all the drama befitting of their first home game of the season and the first game under their new lights Tuesday, April 9, versus Postville. It was a tale of two sets of brothers in the scoring department to give Decorah the 2-1 win. Junior Willem Hawley opened scoring with a left-footed strike from the top of the box midway through the first half. His goal, scored at the 20:00 mark, was assisted by junior Thomas Hadley. Postville answered on a quality set piece and left the game tied 1-1 at half. A re-aggravated thumb injury to starting keeper Peter Wilson meant freshman Brayden Reiser saw his first career action in the second half. Reiser wasn’t called on often but was up to the challenge at every opportunity. Junior Beau Hawley broke the deadlock in the 74:00 when his strike from the edge of the box found the opposite side-netting. The goal was assisted by senior Simon Hadley. The Decorah JV squad put depth and quality on display against Postville Tuesday, April 9, at home. Goals by sophomore AJ Morrow, and youngsters Edgar Aguilar and Trysten Finholt secured a decisive 3-0 victory. Freshman Brayden Reiser kept a clean sheet in net with a good mix of veterans and newcomers defending in front of him. Decorah hosts Charles City tonight (Tuesday, April 16) at 5:30 p.m. and will visit Gladbrook-Reinbeck Thursday, April 18 for a 5:30 p.m. start.